Ok, that's the bulk of it! We've also come up with a snazzy new image gallery method that groups the 1,400 odd images relevant to the show together in a quick downloading and easy to use new page. Want to see it for yourself? Just click here! Back at the office now finally, and with only four days of the show to run it feels like an awfully long time ago. Don't worry though, we've waded through the endless press packs and news releases and have identified the most interesting new cars and concepts from the show and you'll see them all online within the week, including extensive photo galleries. Once online we'll send a newsletter to our subscribers too, so if you're not already on the list (it's free and we don't use your email address for any other reason), subscribe now from the Home Page. Well, it's been an eventful first day at the Frankfurt Motor Show, though an odd one. Though it will mean little to most of the public show goers, the structure of the press days has changed, with today being a press people only day where it has traditionally been for press and trade. The result is that the unveilings are spread out over two days and today even some of the show stands were not ready to walk through and the sprawling show was eerily quiet in some areas where it is usually buzzing. That aside, there has been a number of very exciting new cars revealed, as well as a few surprising concepts. The most striking is the Mini Concept Frankfurt, showing us first of all what the next generation of Minis will look like, and secondly that BMW is seriously considering resurrecting the lifestyle Mini in the form of a coupe/estate crossover. One of the best-looking concepts on show was also from BMW - the Z4 Coupe Concept. Surely this car has to make production? How can it not?! DaimlerChrysler's oddest concept is the Smart Crosstown, which interestingly is being billed as a 'show car', not a concept. As ever, the bi-annual Frankfurt Motor Show is set to be a bit special, with more than its fair share of tantalising concept cars and production car debuts. The Car Enthusiast will spend a few days at the show to bring you all the latest news and image galleries. Until then we will add preview articles as we learn more. The show itself runs from 15th to the 25th of September. 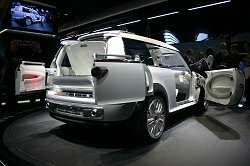 The official show website is www.iaa.de. Aston Martin's long-awaited V8 Vantage is now available to buy. The production version was displayed at the Frankfurt Motor Show. 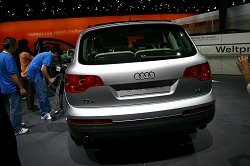 The new Audi Q7 is an eagerly awaited rival to BMW's X5. It will be revealed in Frankfurt next week. In a novel move to publicise the huge development task behind Audi's first proper off-roader, the German company has actually released images of disguised prototypes under test in various harsh environments. Looks like the spy photographers are going to be out of a job! Expect to see the production version of the new Audi Q7 at next month's Frankfurt Motor Show, with sales starting early in 2006. Audi will show the revamped A4 Cabriolet at the Frankfurt Motor Show. We have the details. BMW's WTCC car debuted in Frankfurt and will spawn a special edition showroom model. 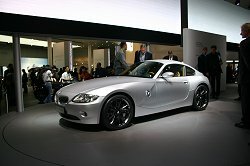 The Z4 Coupe was an unexpected bonus to our visit to the Frankfurt Show. Though billed as a concept car, it is virtually guaranteed to make production. This week we have yet more new BMWs to drool over, including 550i, 650i and 730Ld. The cars will get their show debut in Frankfurt. Cadillac's BLS marks a mainstream European onslaught from the American car maker. The production version debuts in Frankfurt. The C-SportLounge concept car previews the next generation of Citroen MPVs. Looks good. D-Compact previews Daihatsu Terios replacement in Frankfurt. Mini RAV4 anyone? The HVS looks good and uses green technology to enhance the driving experience. Want to know more? Prodrive are now embarking on a production feasibility study for the Fenomenon Stratos. The car was displayed at Frankfurt in Alitalia colours. We took a good look around Ferrari's new F430 Challenge race car in Frankfurt. Fiat has revealed images of its new Grande Punto, due for launch in the UK next year. Ford revealed its new Galaxy MPV in Frankfurt. We were there. This is Ford's iosis show car. It won't make production, but it bodes well for future Fords. This is the new Honda Civic. Different, isn't it? The three-door version debuts in Frankfurt. Where's the Type-R? Hyundai displayed the Accent SR in Frankfurt, previewing the next Accent hatchback, and possibly Hyundai's first proper hot hatch. Jaguar's new XK promises to be much more sporting than the outgoing car, yet retains its elegance. The production car debuts at the Frankfurt Show. Months before it was due to be unveiled to the public, we have scoop photographs of Jaguar's fantastic new XK sportscar. The Multi-S is a new breed of sporty MPV accoridng to Kia, though probably not pointing to a new production model. The show car was displayed at the Frankfurt Motor Show. Lamborghini's desirable new Gallardo Spyder was revealed at the Frankfurt Show. We were there to drool all over the paintwork. 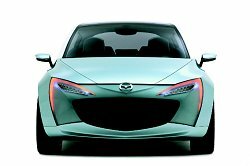 Mazda will show the Sassou concept car in Frankfurt - a preview for the next generation of city cars. Mercedes will reveal the preposterous ML 63 AMG at Frankfurt complete with a 510bhp V8 engine. What is happening to the world? Frankfurt 2005 will see the first public viewing of the sharp new S-class Mercedes-Benz. First details online now. Mini surprised the hoards in Frankfurt with this concept car, though dig a little deeper and you'll discover a lot more than a mere show car. Mitsubishi displayed the Concept Sportback at the Frankfurt Motor Show, previewing a new generation of sporty Mitsubishis. Click on the image to access the full gallery of images. Mitsubishi will reveal the Concept Sportback at the Frankfurt Show - the next Evo? The new Nissan Note debuts in Frankfurt, to sit above the Micra supermini, rivalling cars such as the Fiat Grande Punto and VW Polo. The new Peugeot 407 Coupe actually looks better than the Prologue version previewing it at the Geneva Motor Show this year. This wacky creation is Peugeot's latest concept car, called the 20Cup. We think it holds clues to the forthcoming Peugeot 207. The Porsche Cayman S drew one of the biggest crowds at the 2005 Frankfurt Motor Show. We were there to bring you some of the car's first public photographs. The new Porsche 911 Carrera 4 Cabriolet goes on sale in October. The teasing has started already. We know that the Boxster coupe will be called the Cayman, and is likely to be unveiled at Frankfurt in September. With the launch of the Clio III comes the prospect of some all new Renaultsport hot hatches. A concept version will be shown in Frankfurt. The Smart Crosstown was shown in Frankfurt as a test bed for new design ideas. We're not so sure it works in the UK. Phew! The new Impreza doesn't look as ugly as we thought it might. It is actually rather nice. It debuted in Frankfurt. We took a closer look at the facelifted Subaru Forester at the Frankfurt Motor Show. Suzuki's all-new Grand Vitara has gone on sale in the UK offering style and value for money. Frankfurt was the car's first public outing. Toyota's all-new RAV4 debuted at the Frankfurt Show last week. We were there. The Endo concept car sits next to the new Yaris and RAV4 on the Toyota stand in Frankfurt. Vauxhall's Astra TwinTop is the latest folding hardtop to join this burgeoning market. It debuts in Frankfurt. The Antara concept shown in Frankfurt may look futuristic, but we think it previews a new Vauxhall SUV crossover. Vauxhall claims that the sharp new Vectra VXR is Britain's fastest hatch. It debuts at the Frankfurt Show. VW's new Eos folding hardtop is a classy number, and apparently not a Golf-sized car. It made its debut in Frankfurt. The new VW Passat Estate is on sale now, following its Frankfurt Show debut. 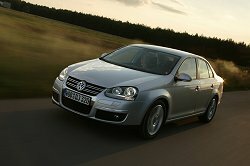 The R32 badge returns on the latest Golf, due to debut at the Frankfurt Show. Volvo's new C70 takes the form of a coupe-cabriolet, and looks like a winner.